Company Name: Tanaka Hydropower Co,. Ltd. 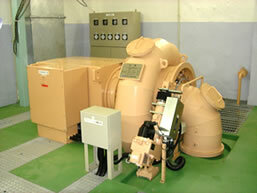 Founded in 1932, Tanaka Hydropower has a long standing history within the hydropower market. Currently, we are the domestic market leader in the design, implementation, repair and renovation of micro hydroelectric systems. We provide complete water to wire solutions and offer a comprehensive selection of turbines, generators and controllers. It is our mission to continually offer high quality and cost effective solutions which fit the changing needs of our customers. To meet the environmental challenges the world faces today, we, at Tanaka Hydropower, strive to further promote the use of small scale hydropower. Electricity is essential for modern life, and our goal is to provide this indispensible electricity in an environmental friendly manner. By offering a cost effective, high quality hydropower solution, we aim to work towards the realization of a low-carbon society. The Francis turbine is a reaction turbine, which means that the water changes pressure as it moves through the turbine, giving up its energy. First, high pressure water enters the turbine through the spiral casing surrounding the guide vanes. Then water passes through guide vanes where it is directed to strike the blades on the runner at optimum angles. 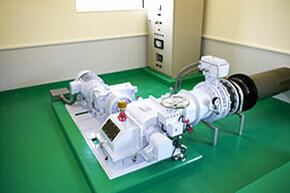 The Inline Linkess Francis turbine was jointly developed between Tokyo Electric Power Company, Tokyo Electric Generation Company and Tanaka Hydropower and commercially released in 2007. It was developed expressly for the purpose of installation within space restricted areas such as existing pumping stations, water treatment facilities, and drainage systems. The cross-flow turbine consists of a cylindrical runner with a horizontal shaft, composed of numerous blades, arranged radially and tangentially. Unlike most water turbines, which have axial or radial flows, in a cross-flow turbine the water passes through the turbine transversely, or across the turbine blades. The water flows first from the outside of the turbine to its inside, and then after passing the runner, it leaves on the opposite side. The Pelton turbine extracts energy from the impulse of moving water, as opposed to reactive turbines such as the Francis turbine. Water passes through a nozzle(s) and strikes the buckets arranged on the periphery of a runner which causes the runner to rotate, producing mechanical energy. The buckets were designed so that when the rim runs at half the speed of the water jet, the water leaves the runner with very little speed, extracting almost all of its energy, and allowing for a very efficient turbine. The turgo turbine is type of impulse turbine that is similar to the Pelton turbine but can handle higher flow rates although it is slightly less efficient. The incoming water jet from the nozzle strikes the plane of the runner on one side (usually at an angle of about 25°) and exits on the other side. Since the water jet interferes less with the runner than the Pelton design, it can handle more flow than a same diameter Pelton runner, leading to reduced generator and installation costs. 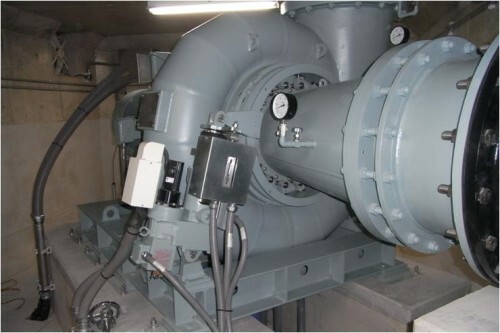 As part of Tanaka Hydropower’s complete “water to wire” solution, we offer control systems to allow for the control, regulation and monitoring of a hydropower plant. This control systems allows for the control, regulation and monitoring of the turbine(s), generator(s), sluice gate and screen/filter. We also offer independently operated control systems intended for irrigation water or existing water systems (pumping station, filtration plants, etc.). The all-in-one control system integrates the following functions: (1) control, regulation and monitoring of the turbine(s), generator(s), sluice gate and screen/filter (2) remote monitoring and control (3) data logging. Voltage, current, power and other relevant data is displayed digitally on a touch panel display. The main circuit cubicle connects the hydropower related equipment to a power distribution line or to a load device. We will design and produce a main circuit cubicle specific to your operational environment and needs. This allows for the remote monitoring and control of a hydropower plant through the use of a dedicated telephone line or through the use of the Internet or a mobile phone network. Operational status and alerts can be sent via email, and controls can be adjusted remotely as well.